Our wishes on our concerts are to introduse the histories, arts, cultures from warm signtseeing spot "Izu"which is very close from Tokyo Central, and to make our town as proudlｙ spot to satisfy visiters who want to visit us or want to live here. Our charges (Attendant Fee) are so limited and reasonable to continue our concerts every year upon our expenses. We thank from the bottom of our hearts for those people who understood our policy and suported us so that we counted 20 times this year. ・In this salon there is a masterpiece "Estey Reed Organ" of civilized years. The concerts reappearing the tones of 177 years ago can be held sometimes. ・We offer any type of people the music town concerts with high quarity music over any genres to follow the. town event schedules. ・The salon has a very rare music instrument ♪Aida horn which was ordered to Amati Inc. to make by Berlin Philharmony Orchestra for Opera "Aida by Verdi". Bsides, thre are a grand piano(Yamaha), an upright piano (Yamaha) and Cravinova(Yamaha). ♪You can practice with those. ・For school students special plan is available with volanteer concert in free of charge. 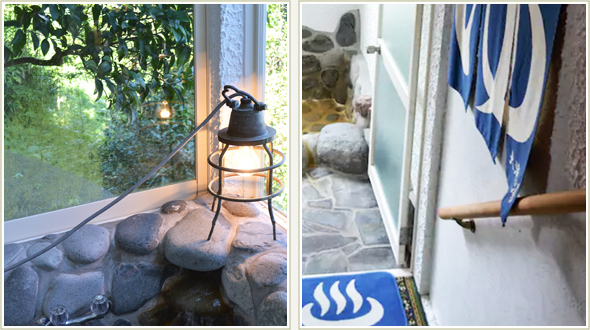 ・For the guests from far distance, we have tie-up connections with hotspring hotels around here. At the time without live performances you can enjoy comfortable BGM by CD in nature, CDs based on change of seasons, weather conditions and times. All nice music are selected by president Toyoda who has been supplying hearty music for 40 years. The site has a stream with a lot of horseradish,Japanese parsley and cressons. We can serve you with Pesticide-free cultivation vegitables and fresh fishes from near sea. Natural water is also good for your health and good taste because it comes from the top of Mukouda River. Tea is blended with fresh teas made by Pesticide-free cultivation in the tea fields near here. It is so sweet and you can recover soon. ・Mozart Coffee This coffee has drip one by one after your order. Please enjoy the special aroma. The tea is pesticide-free, which was locally grown. The aroma and taste also delicious, and you become healthy. 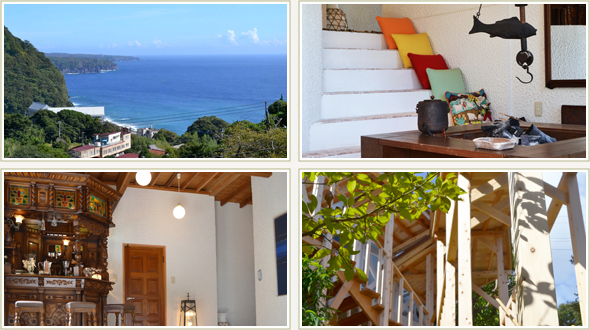 Detached Room to stay overnight for 2 days use 〈members only〉 2 floor house in European Cottage style with Sea-viewing. Available for Piano Lessons, small chamber orchestra lessens, chorus lessens, health resort, seminars. Carrying instruments acceptable, Acoustic ones only. our hot spring is a luxurious hot spring, because it contains a lot of nutrients of nature. Please enjoy the real Japanese hot spring. And the bathtub is made of natural stone that contains a lot of natural energy. You could chill out and get great experience! And the bathtub is really wide, so you can enjoy really good time with your family or friends. Ocean view from the hot spring is so beautiful. “Gensen Kakenagashi” It is hot spring water directly from the source, flowing through the bath tub without circulation. So you will able to enjoy always fresh hot spring source. Effect It is safety soft hot water for children and old man and sensitive skin can soak in the bathtub. Effect is fatigue, stress, health promotion, and recovery of nerve, muscle, the internal organs.